Well, as a Citrix Admin, you are able to prevent any users from accessing your Citrix XenApp servers, especially when the server is under maintenance mode, or you purposely want to put the server out-of-loads. there are 2 ways to do this; GUI or command. Users are not able to remote to the server, no RDP, no ICA, nothing. For Command Line, it only can be used locally. I haven't try using PSTOOL yet, but I will update this post whether I can access the server using PSTOOL after logon disabled. For GUI, as we will use Citrix Console, hence it can be done remotely from other Citrix XenApp servers, within the same farm. Hence, if the farm only has one Citrix XenApp server, then you need to get in the box via physically there or virtualization client. Disable / enable logon for Citrix XenApp servers via Command Line. RDP to the Citrix XenApp server, and open Command prompt. firstly, you may want to type Change Logon in order to know what commands can be used. In order to check current logon mode, type Change Logon /Query. 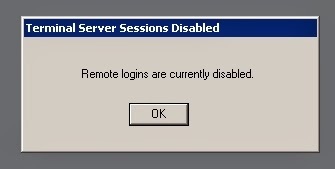 It will let you know whether session logins are enabled or disabled. In order to disable it, type Change Logon /disable. After a few moemnt, you will be prompted with the new status of session logins. Hence, when users try to RDP the server, they will see this. For ICA connections, this server will not be used. If one published application was published only to that server, then users will not be able to access that application. if you want to enable logon back, just type Change Logon /enable. Users will able to access the server back after a few moments.